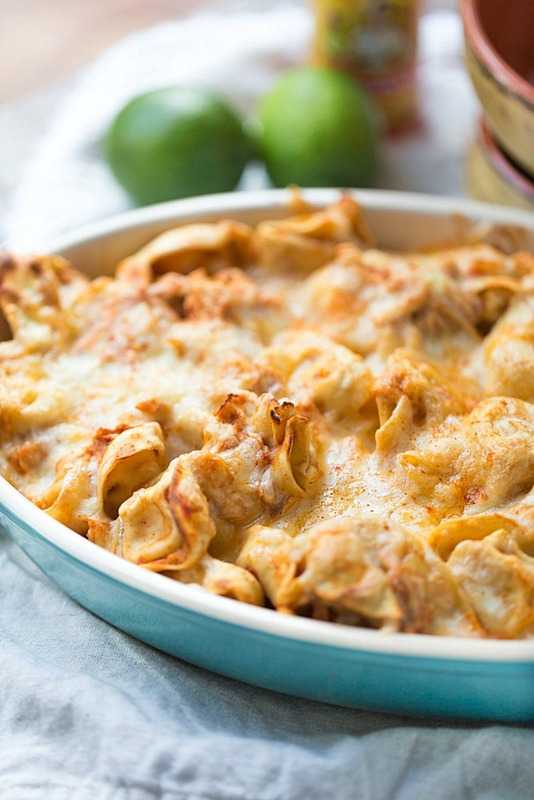 Easy Chicken Enchilada Tortellini Bake: dinner ready to serve in 30 minutes. Only 5 items from your pantry are needed to make this recipe. 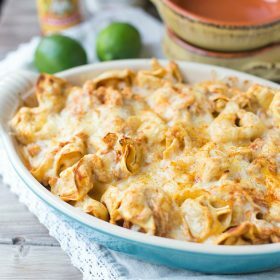 This chicken enchilada tortellini bake is a life saver because you only need to use 5 simple items from your pantry to make this recipe. The recipe only takes about 25 minutes from prep to table. It’s easy to make, too. I cooked the chicken in my slow cooker but leftover or rotisserie chicken works too. I made the sauce with enchilada sauce and spicy red pepper diced tomatoes. The pasta was simple: I used refrigerated garlic cheese tortellini because it cooks quickly. Once I mixed the tortellini and sauce together I poured it into a 1.5 quart baking dish. Then I sprinkled it with shredded Mexican cheese. Finally, I baked it at 400 for 10 minutes. When it was done baking, I turned on my broiler and broiled for 5 minutes until the cheese was slightly browned and bubbly. 2 1/2 C of cooked chicken breast. I’ve included instructions below for slow cooking but you could use a rotisserie chicken, too. 2 9oz packages of refrigerated tortellini. I used Butoni Roasted Garlic and Cheese. 1 15oz can of all natural enchilada sauce. I used [url:1]this[/url] brand. To Slow Cook the Chicken: If slow cooking the chicken, spray the inside of a slow cooker with cooking spray. Place two split chicken breasts (with the bones and skin – keeps it tender) in the slow cooker and sprinkle with salt, pepper and ground chipotle pepper, if desired. Place 1/2 C chicken broth in the slow cooker, cover and cook on low for 5-6 hours or until the chicken reaches an internal temperature of 165 degrees. Once the chicken is done cooking, remove from the bones, remove the skin and shred. For using Rotisserie Chicken: Remove the skin from the rotisserie chicken. Pull the chicken breasts from the bones and shred with a fork. Cook the tortellini according to package directions. Once done cooking, drain and return to the pot. Prepare the sauce. Place the enchilada sauce and the diced tomatoes into a blender and blend. You can also place these two items into a large bowl and blend with an immersion blender. Prepare the tortellini bake. Add the chicken to the pot with the tortellini. Mix well. Then add desired amount of sauce to the pot. I used about 3/4 of the sauce. The remaining sauce can be stored in an air tight container in a refrigerator for up to a week. Mix everything well and then pour into a 1.5 quart baking dish. Sprinkle with the shredded Mexican cheese. After baking, if desired, turn on the broiler to high and broil for about 5 minutes to brown the cheese. I am dying with how good this looks! 5 ingredients and combines two favorite cuisines?! Genius! Thanks so much, Meg! I know, right? The love of tortellini meets the love of Mexican. YES! I’m totally adding this to our dinner rotation. We love enchilladas and torts! DELISH! Can I make this with shredded beef? Hooray to you for having a vacation and coming back with something this amazing! Julie, I love this!!!! it’s like combining Mexican and Italian food into one dish!!! AWESOME! and looks so good! hope you had a nice, relaxing vacay! Welcome back! I absolutely love everything about this. And it’s so easy! Perfect for a weeknight family dinner. This is absolutely PERFECT!! I’m totally making it soon! Love this combo! 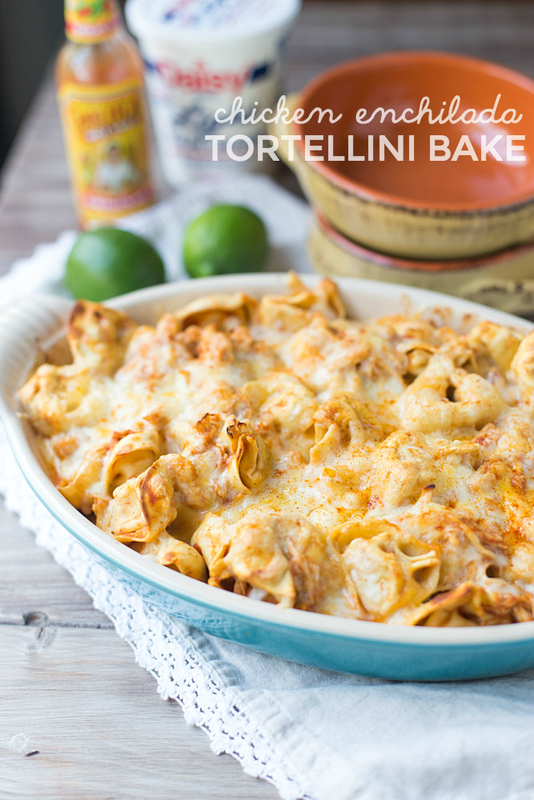 Definitely adding this tortellini bake to our menu soon! Glad you like it, Jessica! Hope you enjoy the recipe if you give it a try! I’m always looking for easy weeknight meals and this one looks great! Glad to hear that you had took a break from blogging and working to enjoy vacation. Thanks so much, Ashley! It was really nice to take a break from everything. I need to do it more often. This looks so easy, yet so flavorful! I totally want to add this to my weeknight dinner rotation! Beautiful and simple! Well done! This is TOOOOOOOOOOOO perfect I have to come home from work, make a QUICK dinner for a guest and then we have to scoot off to an event. What could be quicker than this. Especially if I make it ahead and just have to pop it into the oven. Tasty too. Add salad and it’s over. This is pinned for later! Amazing! This is amazing! 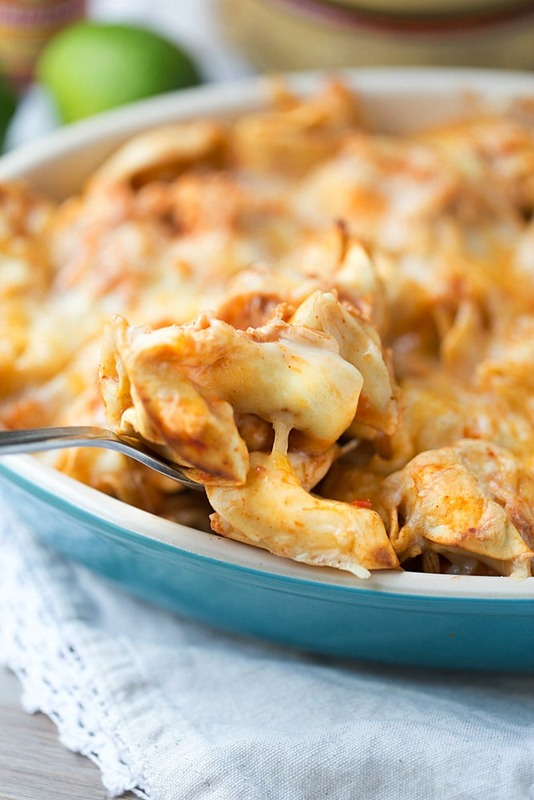 This chicken enchilada tortellini looks so perfect. It’s very cheesy and it’s baked. I really love it! This looks amazing. Do you use red or green ench. sauce? Hi Tammy! I used red enchilada sauce. Hope you enjoy the recipe if you give it a try! Wow! 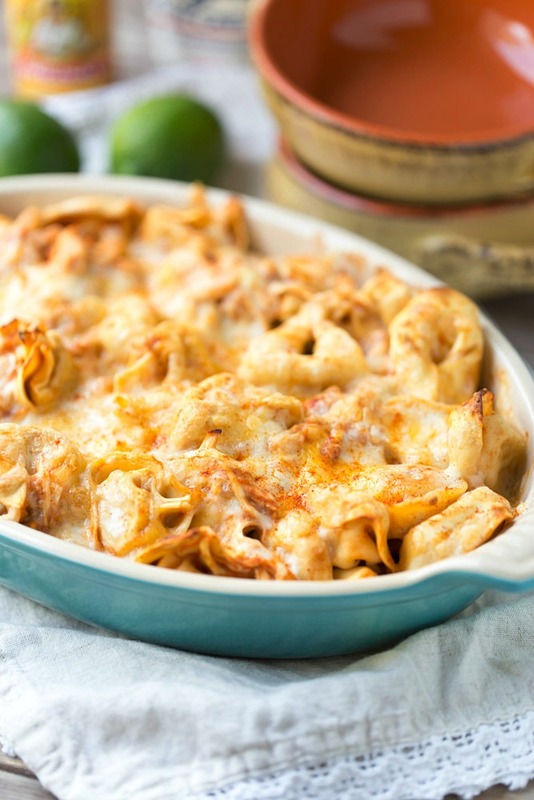 This easy chicken enchilada tortellini bake recipe is incredible! I’m seriously so inspired right now. I need to add bell pepper to recipe and it would be perfect. Thx for sharing! Sorry I did not like this!!!!! I thought it was gross! That’s too bad! I love it but I know I can’t please everyone with my recipes. Thank you for taking time to leave a comment to let me know how you feel about the recipe.